Long before I wrote New Prairie Kitchen or drafted recipes for magazines, and farmer’s market blogs, I was a vendor at the Omaha Farmers Market selling bags of marshmallows tied with an orange ribbon. My boutique bakery was called Orange Poppy, and on Saturdays in the early spring and fall I set up my table and umbrella, then filled wire refrigerator baskets to the brim with marshmallows of every flavor imaginable – apple cider, chai, and peppermint in the fall, honey raspberry, chocolate, and vanilla bean in the spring. I added other flavors like toasted coconut or lavender honey when the mood struck me. I’d spend the entire week destroying my kitchen with pans of sticky, sweet confections stacked on every counter top and worked late into Friday evening cutting, counting, filling and labeling every bag. I loved making them, and I still do, but the morning comes early when you are up late with a baby, and trying to be an entrepreneur. I was frustrated when people sampled one of everything knowing they weren’t going to spend $6 on a bag marshmallows or they would let their army of children clean me out. I needed those samples to sell my product, and they treated my hard work like a free candy buffet. On the other hand, I also gained a loyal following of people who not only connected with the treats I made, but also with me. I loved seeing their faces each week, and providing a little bit of whimsy for their day. The more people got to know me, and my product the less the samples mattered. The experience provided a deeper understanding of the farmer’s market experience from the other side of the table. If it rained, and no one showed up to the market at least my confections had a shelf-life, and could return another week. That’s not always the case when it comes to fresh produce or freshly made cookies and pies. The whole experience made me realize how hard everyone at the farmer’s market works to bring their goods to the serious shoppers and the casual people gazers who stroll the streets of the market every weekend. My experience was an early step in the journey toward writing about farmers in New Prairie Kitchen. I wanted you to know them as I had. I wanted you to understand what it means to buy something from them, and how important your dollar is to their livelihood. I only lasted one season as a farmer’s market vendor. My husband wanted our kitchen back, and I was pregnant with our second child. When I looked at my five-year plan, building a successful candy business wasn’t part of it. 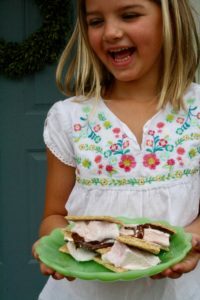 I continued to sell my marshmallows to a small, but loyal following around the holidays, and spent my weeks writing a book rather than tying orange ribbons in bows. These soft, flavorful confections are still a family favorite, and taste nothing like what you can buy in the stores (although marshmallows have gone a little more gourmet in the eight years since I was at market). 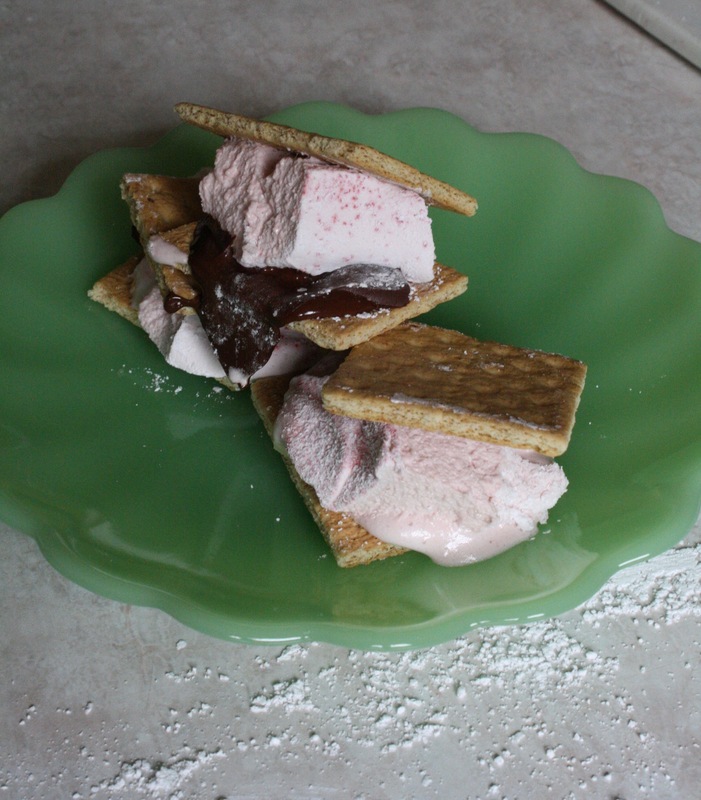 I think homemade is best, which is why I’m giving up one of my favorite marshmallow recipes, Raspberry Honey, to make your summer s’mores and long nights around the fire a little sweeter. These marshmallows are made with honey, which I stock up on every year at the Omaha Farmers Market. They take 24 hours to dry, so give yourself a little time. If you plan on roasting them over an open fire be aware that they are incredibly soft, and melt faster than a grocery store marshmallow. You can give yourself a little extra leeway by leaving them out on the counter top for a day or two after they’ve been cut. Lay parchment paper in a 9×13 inch cake pan making sure to cover the bottom and the sides. Spray lightly with cooking spray. Set aside. In the bowl of a stand mixer fitted with the whisk attachment add a ½ cup of cold juice and sprinkle gelatin packets over it. Let it bloom while you prepare the rest of the candy. Take a second sheet of parchment, fold it in half so there is a crease in it. In a spice or coffee grinder add ½ cup of the freeze-dried raspberries. Pulse them until they are dust. Pour them through a fine mesh strainer and sift them onto the parchment paper. Discard the seeds. If a few seeds get through don’t worry about it. In a medium saucepan combine honey, sugar, salt, the remaining juice and raspberry dust over medium heat stirring gently. Once the sugar begins to melt stop stirring and bring the liquid up to 240 degrees. Pour sugar liquid into the mixer with speed on low. Once the mixture begins to thicken increase speed to high and beat for about 13 minutes. Add the extracts and beat for one minute more. Using a spatula scoop mixture into prepared pan. 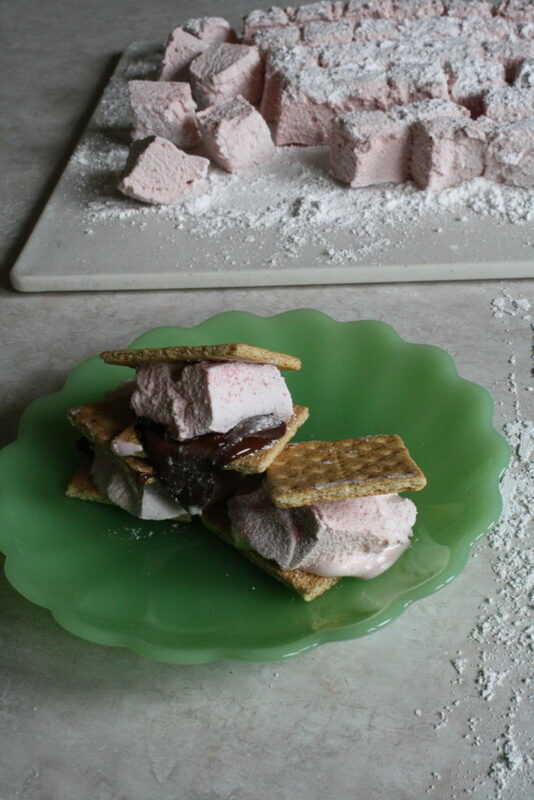 Grind the remaining ¼ cup raspberries and sift over the top of the marshmallow. Let sit uncovered on the counter for 24 hours. Flip marshmallows out of pan onto a cutting board dusted with powdered sugar. Dust the other side with powdered sugar as well. 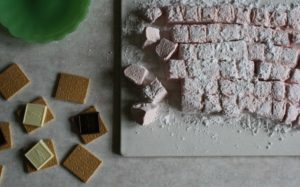 Using a pastry cutter slice marshmallows. Roll each in powdered sugar. Store in a Ziploc bag at room temperature for up to one month or freeze for up to 4 months. Love this Market Meal? Tell us about it on Social Media! 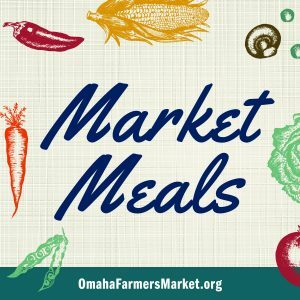 Tag the Omaha Farmers Market on Facebook and Instagram, tag scaldedmilk_ on Instagram and tag New Prairie Kitchen on Facebook. 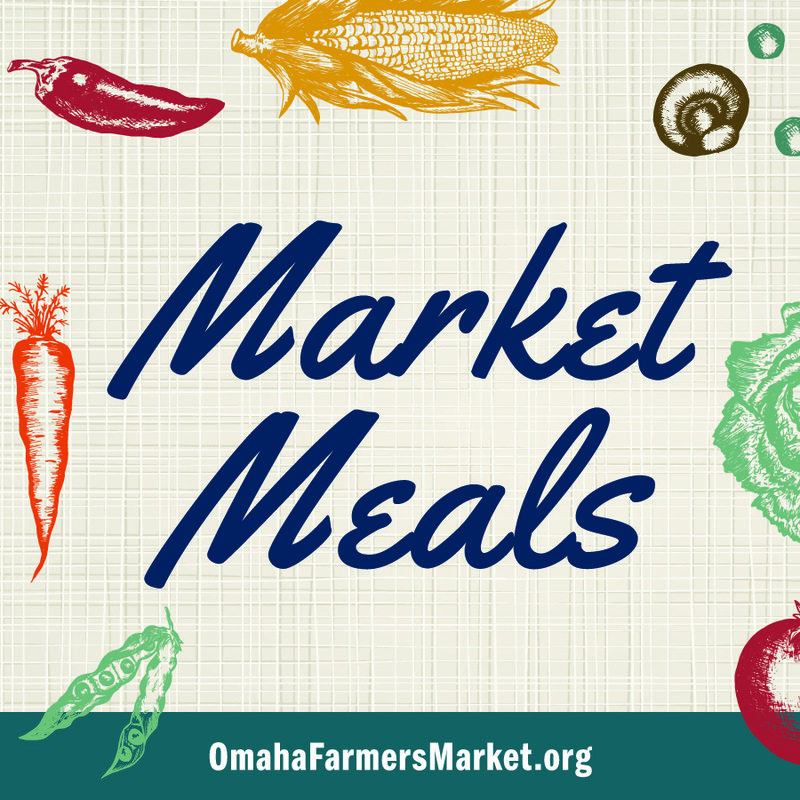 Make sure to use #OmahaMarketMeals!